Legal thought in this country has always focused on the rules rather than on the persons affected by the rules. 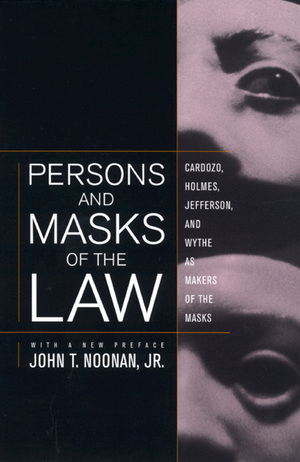 Persons and Masks of the Law restores the balance by taking a person-centered view of the law. The author shows how even great jurists have chosen the "masks of the law" over persons, his surprising examples being Thomas Jefferson, George Wythe, Benjamin Cardozo, and Oliver Wendell Holmes, Jr.--four of the greatest lawyers of the United States. Noonan discusses how the concept of property, applied to a person, is a perfect mask since no trace of human identity remains. An auction of slaves in Virginia, the takeover of a banana plantation in Costa Rica, and an accident on the Long Island railroad are the famous cases involving these four legal giants. The stories of the litigations at three different periods of our history provide and new and powerful analyses of American law. This book, breaking through the formalism in which jurisprudence is enshrined, offers a new vision of law and represents a call for reform in the education and even behavior of lawyers. John T. Noonan Jr. has served as Judge on the United States Circuit Court of Appeals for the Ninth Circuit since 1986. He is Robbins Professor Emeritus at Boalt School of Law at the University of California, Berkeley, and the author of prize-winning work in history, philosophy, and theology. His books include The Lustre of Our Country: The American Experience of Religious Freedom (1998), Bribes (1988) and The Antelope: The Ordeal of the Recaptured Africans in the Administrations of James Monroe and John Quincy Adams (1977), all from California.